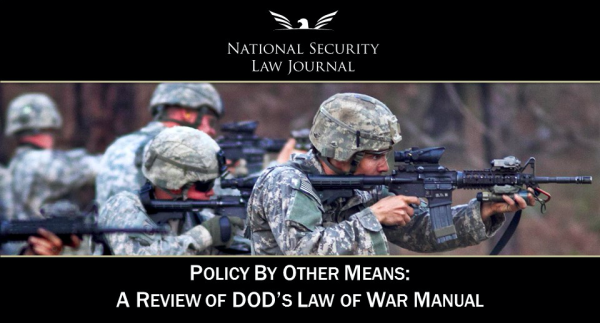 On Monday, November 16, 2015, the National Security Law Journal hosted Policy By Other Means: A Review of DOD’s Law of War Manual at the Arlington Campus of the George Mason University. The event featured a spirited debate on DOD’s recently published department-wide law of war manual. Moderated by Mr. Harvey Rishikof, former Chair of the ABA Standing Committee on Law and National Security, the distinguished panel included Mr. Matthew McCormack, Associate General Counsel from the Department of Defense, Dr. Nicholas Rostow, a Professor from the National Defense University, and Mr. Tom Bowman, National Public Radio’s Pentagon reporter. All three panelists commented on the novelty of the Law of War Manual and addressed current controversies surrounding the unprecedented publication, including the Manual’s impact on journalists who are embedded with deployed military units. Matthew McCormack serves as an Associate General Counsel within the Office of the General Counsel of the Department of Defense. He provides legal advice for national-level, Executive Branch decision-making on issues related to the law of war and arms control. He has served on the U.S. delegations for the Arms Trade Treaty, the Convention on Certain Conventional Weapons, the 31st International Conference of the Red Cross and Red Crescent, the Copenhagen Process on the Handling Detainees in International Military Operations, and other international negotiations and thematic discussions. Dr. Nicholas Rostow is a University Professor at the National Defense University, specializing in international and national security law and affairs and U.S. government and international decision-making in foreign and national security policy. In addition, he is a Senior Research Scholar at the Yale Law School. Tom Bowman is an NPR National Desk reporter covering the Pentagon. In his current role, Bowman has traveled to Iraq and Afghanistan, often for month-long visits, while embedded with U.S. Marines and soldiers.